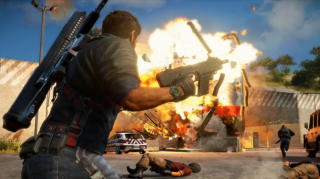 I can think of few better ways to wake up on the internet than with a new trailer for Just Cause 3, the colourful, silly, destructive open-world action game, and the most effective antidote yet for the Tuesday blues. It's the first trailer that shows game footage, and while there's a bit of gubbins about pre-order-exclusive DLC at the very end, it's mostly content to show us all the explosions, wingsuiting, grappling and further explosions we'd expect from a game in Avalanche's series. See Rico topple buses and trains, and crash planes into things in the above trailer, then hit the restart button to watch the bit where he backflips over a plummeting car again. I can't think of a better game to play on a long, hot Summer's day, so of course it's releasing "holiday 2015" instead.